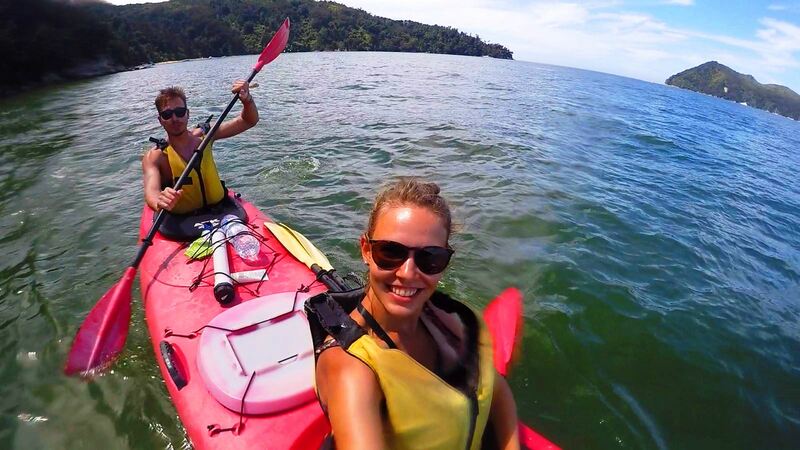 Discover the second chapter of Eileen’s uni stories and experiences in New Zealand below. Whom do you miss the most from home? Mostly family and close friends. But social media made it easy to stay in touch. I have some friends I texted with every single day. How did people welcome you? Everyone was really friendly and keen to get to know me. NMIT staff showed me around uni and town. I also got invited over for dinner by some colleagues and they introduced me to some girls my age. When I had questions, they really answered them detailed and made sure I was ok.
Do you have any favourite spots in the city? I loved the centre of New Zealand, a hill you can walk on. I went there every morning with a friend. I also liked Tahunanui beach on the outskirts of town. 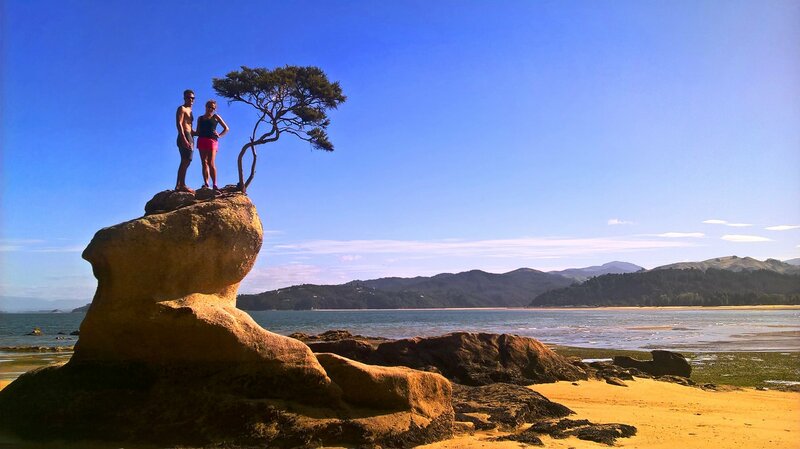 My favourite spot was Abel Tasman National Park, about one hour away from Nelson and absolutely stunning! I have been there a couple of times, on my own and with friends. Did you experience something that you didn’t get to experience in your home country? I travelled a lot and did some great activities like canyoning, white water rafting or kayaking I wouldn’t have done back home. How often do you speak with your friends/family from home? And what type of communication channels do you use to keep in touch? We mostly communicated via WhatsApp, talking or texting and I kept sending them photos. I talked to my family a couple of times a week. Have you toured around the country? If so, give us the top must-see places. I did a bus tour that covered the South Island. Must-see places: Abel Tasman National Park (great for hiking, kayaking, canyoning, sailing), Nelson Lakes National Park (great for hikes); Wanaka, Queenstown, Kaikoura (great for Dolphin swimming and Whale Watching). What’s the best thing about New Zealand? I love the nature: New Zealand offers a vast variety of landscapes and everything is absolutely amazing! Distances are not too long to cover so you can travel around easily and see a lot of different spectacular landscapes. What’s the greatest cultural element you discovered here, something that you would potentially want to ‘implement’ in Germany? The lifestyle! Everyone is really relaxed with an easy-going lifestyle, being friendly and open-minded to everyone. People are not as stressed-out as they are in Germany. Do you see yourself staying in this country and making a living here? Why? I really could imagine living there. The townships aren’t too different compared to what you are used to as a European. And the beautiful nature is something I could look at forever. Furthermore, I enjoyed working because the atmosphere was really nice and it was always fun. Did you speak English prior to your arrival or you had to take English classes? I learned English since grade 5. Why did you choose to do a degree in Marketing? Internships are part of my studies from my home university. Marketing is part of public relations which is part of my studies. So I decided to go to the Marketing Department as I thought it might be very diverting and exciting, especially with the upcoming events I could help out with such as graduations, careers day or trade fairs. I also gained some skills in website editing which is very helpful with my future career. How did you find the courses? Which one is your favourite and why? My tasks varied a lot and were very interesting. I mostly enjoyed the organization of the graduations on the three campuses; I could even travel to their Global Campus in Auckland to set it up. I also took part in the Years 8 Careers Day and helped out to promote the NMIT at a trade fair. Furthermore, I enjoyed working independently, which I could do while editing the website. During your studies, what has been the most challenging moment? How did you overcome it? Sitting in front of a task and realizing that I had absolutely no clue how to start. After going through it, I slowly started to understand what I should do and when I was half-through I went to my boss to have her check if I am on the right track. Share with us the most memorable moments at uni. Christmas -staff party on the yawn in the sun – I was used to a white and cold Christmas. Graduation ceremonies (getting to know the culture and being in touch with locals was really special) and regalia preparation with some volunteer ladies. What are your top tips to study during exams? How do you cope? Doing the exercises and revising them. What do you usually do during break season? I usually go back home to be with my family and to meet my friends as we all study in different cities. Once or twice a year I go on holiday with my family or some friends. Give your top tips that would make any high school student want to study overseas. You can learn a lot about yourself, a new language and a new country and culture. It is a huge development on oneself and one becomes way more self-confident. You grow through the challenge of coping with so far unknown situations and start to trust your decisions. Making new friends in another country and discovering the culture and surroundings with them gives you everlasting memories. When you depart, you already plan your next visit and try to catch up with them as soon as possible. It also widens your horizon to get to know another culture by living there and experiencing it first-hand. What’s the best thing about being an international student? All the new experiences: it never gets boring. The country, culture and city – everything is totally new and exciting. You also have the chance to travel around on weekends or your free time to discover the country and you can live in places people only dream of. What’s your plan for the future, where do you think that a degree at this uni take you? I will finish my BA at my uni in Germany. I hope to find a job somewhere close to my hometown that includes work with public relations and I want to travel every now and then. Special thanks to Eileen Gatzke from Germany for sharing all this with us. Eileen has graduated from the Markgrafengymnasium Karlsruhe-Durlach and was an intern in the marketing department of NMIT in New Zealand. She currently studies Public Management at the University of Applied Sciences in Kehl, Germany. You can find out more about why other students have chosen NMIT on the WhyStudyhere page.